Week 28: Discover. Internet. Faith. Bombs. Muslims. Should be Proud of. At OIS Graduation. newspaper ads like the Metro. reading that as you browse through the billboard ads on the bus. certainly an excellent way to combat that. discover u life course to find out. PDA. You can open documents, browse the internet or watch videos. But do you know how the Internet came to be? which you can watch on youtube. And also to collect funds for distraught brothers and sisters around the world. Why can’t we become positive revolutionist in technology and the likes. For example, many people refer to the atomic bombs that Pakistan has developed as the Islamic Bomb. Why is it though that we couldn’t develop these types of bombs. This is my kind of Bombs: SeedBombs of course. Instead of being inventors of destruction, why can’t we be inventors of spreading goodness, beauty and benefit. Here are some enlightening thoughts from the valedictorian at the Ottawa Islamic School’s high-school graduation ceremony. A new segment on how to keep healthy with weekly tips. it is very easy to spread our germs if we cough or sneeze in them. their mouth is covered by their sleeve and not their hand. (Trolley Station) from 11 a.m. to 5 p.m.
10 am to 5 pm at Vincent Massy Park- Riverside Dr.
(includes transportation and admission) — Sign up Here! A great lecture on squeezing every opportunity to do good and reap rewards. Br Shabir explains why the bodies and minds we have need to be kept healthy and clean. He analyzes Islamic resources that focus upon physical and mental conditions and why it is an important practice within the religion. Fashion Show A shocking number of Muslim sisters in Ottawa are unaware of the many locations throughout the city where they can buy Islamic clothing. An opportunity will arise June 20 for Ottawa’s Muslimaat to attend a fashion show which will showcase Islamic wear from shops around the city. For Sisters By Sisters Fashion Show will take place at Jim Durrell Complex, 1265 Walkley Road, from 3-6 pm, June 20. We ask that only Muslim women attend, meaning no children under the age of fourteen. There will be door prizes and refreshments offered, and tickets are $10. 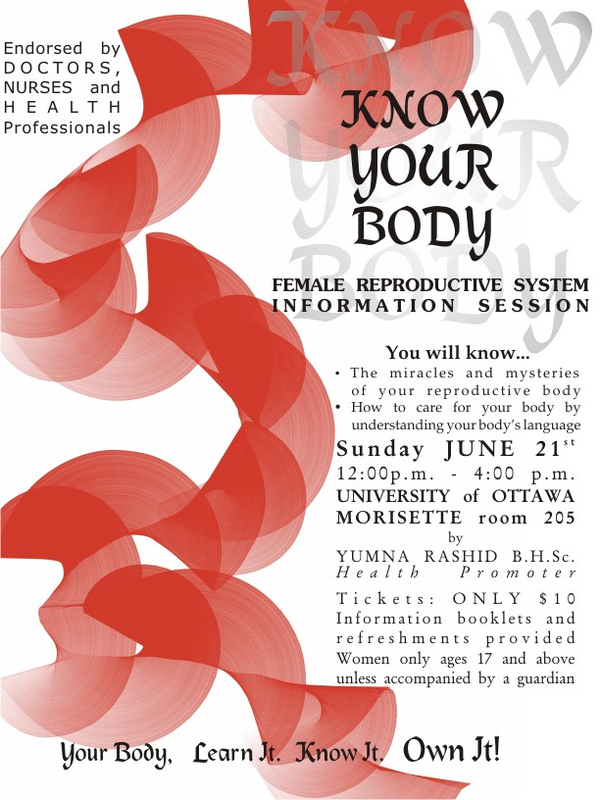 Please call sister Fatimah at 613-225-4528 for more information or for advance tickets. Come and learn the miracles and mysteries of one of Allah’s most incredible creations………YOU! Are We Pushing Our Children from the Masajid? Yusuf Islam was in the U.S. to promote his new album, Roadsinger. He was invited on various shows including Colbert Report and Jay Leno to sing a few songs from his new album. He is no doubt a legend in the entertainment industry, which makes him a great daee. He said on the Colbert report that he is promoting his album to educate. He sang the song, Boots and Sand on one of the shows which is about how he was listed as a terrorist and banned from entering the U.S. five years ago. Muslims are slowly but surely integrating back into society as normal individuals as displayed in mainstream media. Seeing as media is one of the greatest influences on societal attitudes it seems that tolerance towards muslims is slowly underway. June 8th: Be the Change – more to come on this soon. Your moment of Zen Alhamdulillah for Islam! The Scholarship is based on these students’ dedication to their community. Ms. Loula Abib, registered in the Bachelor of Arts (Psychology) program at the University of Ottawa. She divides her volunteer time between St. Vincent de Paul Hospital and the Lowertown Youth Centre. Ms. Sagal Osman, is registered in the Bachelor of Arts (Law) program at Carleton University. Ms. Osman is involved in the community through her volunteer position as Community House Board Director at Britannia Woods Community House. Mr. Samatar Yusuf, is registered in the Bachelor of Arts (Economics) program at Carleton University. Mr. Yusuf volunteers at the Boys and Girls Club, the Somali Unity Student Association at Carleton, and through his school and mosque tutors teen children in math and guidance. In what is certainly a hopeful turn of events, Senator John Kerry and Reps Keith Ellison and Brian Baird visited Gaza last week, the first US government officials to do so in more than three years. The three were by all accounts absolutely shocked by the devastation that they witnessed, and Reps Ellison and Baird, at least, have issued very strong statements. Rep. Baird’s statement is printed below. An Israeli arrives at London’s Heathrow airport. As the title of today’s show suggests we’re going to talk about black history from an Islamic perspective. Before we delve into this we need to think about if this is something that merits a Muslim perspective. The reality is that not only did Islam teach us about equality of all human beings regardless of their colour, which would be merit enough to give this topic some dedicated air time. But also, unfortunately racism and prejudice is still very much a Jaahily relic that manifests itself in the attitudes, actions, and words of many Muslims until this day. This of course has nothing to do with what Islam teaches us. In fact the prophet peace be upon him would condone the racist statements that early Muslim converts would utter in reference to the first Muathin of the Muslims who was of East African Decent. How Islam Made it’s way to North America in modern history: 30% of African slaves were Muslim. Here is a documentary narrated and hosted by Dr. Abdullah Hakim Quick entitled Ethiopia an Islamic History. 6 Things You Can Do For Islam in 2009: [sound vision] One way to realise your goals and dreams is simply to write down your goals and revisit them regularly. Here’s a nice form and a spread sheet [Free Download] that will help making that easy. Support Muslims how are doing good around the world: IOL MUSLIM STARS VOTE for your Muslim Star. The Muslim Film Festival: (MFF) is dedicated to supporting established and emerging filmmakers worldwide. We provide a platform to share their artistic expressions by screening works that celebrates the diversity and mosaic of Muslim culture. With a focus on dynamic, visionary independent cinema, MFF aims to bring communities together to support these artists and unite in celebration. MFF believes in the talent, support, development, celebration, preservation and network of Muslim independent filmmakers, screenwriters, actors, video producers, television, digital media and visual artists. 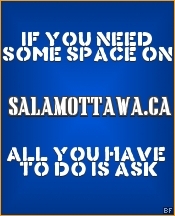 The Sadaqa Food Bank, located on 447 Catherine Street, is in need of your assistance. There are close to 100 families who rely on SFB to supplement their grocery needs on a monthly basis. At this time of the year donations of food and money decrease yet the demands continue to grow. Ibn `Umar (May Allah bepleased with them) reported: Messenger of Allah (PBUH) said, “A Muslim is a brother of (another) Muslim, he neither wrongs him nor does hand him over to one who does him wrong. If anyone fulfills his brother’s needs, Allah will fulfill his needs; if one relieves a Muslim of his troubles, Allah will relieve his troubles on the Day of Resurrection; and if anyone covers up a Muslim (his sins), Allah will cover him up (his sins) on the Resurrection Day”. [Al-Bukhari and Muslim]. Exactly one week has past since the newly sworn in president of the United States took office. What has happened in that time? Muslims and Technology: What will the Nortel down fall bring? Ottawa is home to one of the largest tech companies in Canada. Nortel, also the largest privet employer in Ottawa, recently filed for bankruptcy protection, which means there is going to be some difficult times for a lot of disenfranchised employees of the once tech giant. Many of the employees of Nortel are Muslims. Very talented and well educated Muslims who have bothcontributed and gained a treasure trove of intellectual property over the many years that they haveworked with the company. Obviously there is little that will do to help Muslims in particular in this crisis, amongst their peers. But perhaps that is exactly what we should be looking at. Perhaps we should be asking questions like: what do Muslims do with their knowledge and intellectual property, which they’ve developed throughout their careers? It seems that Muslims, especially in North America, tend to lean heavily towards being employees. They execute the commands and directions of their bosses and employers with little ingenuity, or creative contributions. Are Muslims less educated? Less informed? Or less talented than the rest of the populations? I don’t thinks so. I think it is a lack of motivation and a lack of interest. So where are Muslims now in terms of their technological contributions? Many of us have already used some form of technology in our Islamic lives. From the basics of using our phones, email, or the internet to share and look up information about Islam and Muslims, to downloading software that reminds us of the prayer times. Some of us may also be aware of some dedicated hardware that has been around for a number of years and that we see in many of the conferences and bazaars, and some Muslim book shops. For example, there is the line of digital Qur’an pocket players, and readers from Digi Koran. There are over a dozen of these devices ranging from simple yet functional to advanced and complicated. Prices also range from affordable (you get what you pay for) to expensive (high quality). They even have gift-reasonable prices (DVD’s, Children’s toys, etc. for under $20). Some of their products are even cool, like their CQ4H2 IQRAA Color, Featuring a very bright, impossibly thin OLED. Organic Light Emitting Displays, a technology that allows display panels to be very bright and vibrant, yet be paper thin, is not even available in many devices out right now amongst main stream gadgets. And Judging for the specifications of this device, it looks a lot more feature packed than a lot of mp3/mp4 players out there right now (ie. iPod, Zune, Creative Zen, etc). Other products are a bit out there, and interesting, like their talking pen. One thing that is truly impressive is their slogan of “Focus on the Future”. And from the looks of things in their product line, it seems like they are moving in that direction. Technology doesn’t have to always be entirely invented by Muslims, or marketed by a Muslim company. In many cases all we need to shift ourselves into this century is to utilize some of the technology that is already available and put it to good, productive use. One company that has impressed me with it’s forward thinking and use of the latest trends in tech and marketing is non-other than our local Almaghrib Institute. They’ve taken some serious steps to making the task of gaining knowledge, easy, available, exciting, interesting, and quite simply put, cool. From their use of online forums, which are rarely paralleled with such frequency of visitors and contributors, yet are organized and of such high quality that they stand out as an entity on their own. To their advanced use and integration of multi-media in their classes, in their marketing, in their outreach and even in their community work. Last week, AlMaghrib hosted one of its Ilminars (think: Ilm (knowledge) + seminar) and dedicated it to raising funds for our brothers and sisters in Gaza. By targeting the onlinemasses of Muslims and cooperating with Islamic Relief, they were able to raise close to four times their target of $55,000. In the span of a couple of hours, AlMaghrib along with Islamic Relief were able to raise over $200,000. The concept is not difficult, or complicated. They simply made use of readily available media and resources to create a functional and captivation interface where people are compelled to visit, return, and contribute. This seems to be the philosophy that AlMagrhib is following in terms of the look and feel of this revolutionary educational institute. And I’m very glad and proud to know that one of our local Organization are on the forefront of moving Islamic education and Muslims into the age of information technology. Next week insh’Allah Salam Ottawa we will highlight some other Muslim tech products, and insh’Allah talk to some Muslim tech experts, and see what they have to say about all this. But for now, perhaps this tragedy that has befallen the Muslim tech workers of Nortelmay be a stumbling point for some diverse, ingenious, and innovative steps towards new ideas. Ideas that could change the quality of our lives, and the standard of living for all humanity to something a little bit better, insh’Allah. http://salamottawaforum.googlepages.com/SO_jan27_6_LocalNews.mp3Speaking of Al-Maghrib and taking our lives and contributions to the next level, comes two extraordinary events. How to really live life the way YOU want! The United Nations said Yusuf Islam recorded a rendition of the George Harrison song “The Day the World Gets Round,” along with the German bassist and former Beatles collaborator Klaus Voorman. All proceeds from the song will be donated to the U.N. agency in charge of Palestinian refugees, UNRWA, and to the nonprofit group Save the Children to be directed to aiding Gaza residents. Your Moment of Zen! Alhamdulillah for Islam! “Proof that Israel is Evil. Top Israeli Rabbi says all Gaza civilians are permissible to slaughter. ” [Youtube] He’s qouting from the adultered Tourah.